MassDiGI’s Summer Innovation Program introduces developers to challenges they’re less likely to bump into while working on a personal or individual project. Challenges like how to focus on a joint project without forgetting about individual development. Sometimes you’ll find what’s right for your portfolio isn’t right for your game. 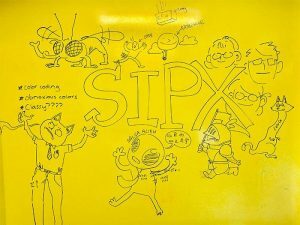 Rather than build a game from the ground up as SIP does, the SIPX program focuses on specific aspects of a pre-existing project—like its UI/UX or a mini game mechanic. There are times where what needs to be done now just doesn’t fit with your past work or future goals. So rather than shoehorning in extraneous work in order create a collection of work with a cohesive voice, how do you strike a balance between finishing the present tasks and planning a future portfolio? As an illustrator I’ve found that compiling your work into a narrative arc can showcase both what you’ve produced and your personal identity as a problem solver. While it differs from case to case, employers often want to see your thought process. What kind of peg are you and how can you fit in their team? If your work can hook them at a glance (sorry, programmers and audio devs), it’s not a bad idea to feed them a bit more info to delve into. It’s the same excitement as seeing unreleased concept art or rifling through a sketchbook: unadulterated thinking before all the what if’s and could be’s are cutout. At the end of the day visuals in games are meant to convey an intangible idea. They can’t stand by themselves. By identifying the cornerstone of our work, that concept in our mind’s eye, we can show viewers what our constraints were, how successful our execution was, and whether this work will be a good fit for their project. While everyone has a different method to their madness, it helps to start with the foundations. Showing sketches of inspirations or a quick quip about your research gives a familiar setting to help orient viewers. For a person who’s never seen your work, context is king. Maybe after that, proof of how your work moved the project along. Sure, you want to show your voice but did iterations of your art elucidate the concept your team was scratching their head over? Or did it waste time by making the conversation meander back and forth? What kind of deliverables can they expect out of you and why did you make this design choice or use that presentation? No employer wants to take a risk on inconsistent work. But honestly in the end one of the best ways to get your name out in the game industry is to physically show up at events. I’ve been finding that after just a few days of studio tours (thanks, MassDiGI) and going to Boston game development talks I’m already seeing familiar faces thanks to the size of the industry. Of course, it was incredibly intimidating and still is! One way to prepare yourself is to start in a structured environment. Go to a talk related to your particular interest. Research who’s going to be there. Bring a friend along (please don’t forget about them). And when you’re comfortable ask the guest speakers questions that can eventually become discussions. Maybe after a while you’ll become a regular. Remember participation grades? It’s a bit like that. The more you contribute to the discussion, the more relevant information people are willing to give back. So, if putting yourself out there feels awkward or pointless at first, just remember the best part of the event hasn’t even begun yet.